Death is the 13th Major Arcana card. One of the more well known tarot cards, many people already know that it doesn’t literally mean ‘You are going to die’, but is open to a more figurative interpretation. Death is a natural part of life, the end of one state and the beginning of another. Death is all around us, and not in a grim way. Everything is temporary. As the name would imply, Death represents the end of a cycle, and also implies the start of a new one with change and transformation. Past – Death in the Past position means that you have recently moved into a new era of your life. There may have been some sacrifice, or it might have been difficult. For example, you may have just ended a relationship, and the pain is still wearing on you. This is likely the best position to see Death in, as you know the hardest parts are behind you. Present – Death in the present position represents an upcoming event or person that will come into your life soon. The wheels are already in motion. It will change your current paradigm of daily life. It could be on your mind daily, as something to worry about or possibly something to anticipate. You’ve got to remember that in one, five or ten years, you won’t even think about it. It’s going to affect you now, but time heals all wounds. Future – Death in the future position represents an event that will happen in the near future. There is always going to be some sorrow in our lives. It’s an element of life that you cannot escape. Don’t dwell on it or worry about it, because it will happen eventually. You likely don’t spend every day worrying about dying, even though you are going to. use this same mentality for your daily worries and nothing will phase you. Work / Education – Death in regards to work or education means that it’s likely that your current employment or study are coming to an end. This could be a good thing if you’re in education, you could be graduating or finishing up school. If you’re working however, it could mean that your current job is going to come to an end, and you may not expect it. It might be worth considering if this is the field you want to work in for a while longer, or if you’d like something new. Romance – Death in romance is not a great sign. Like work, it could mean that your relationship will end, or get difficult. If you’re in a relationship because you feel you need to be, instead of it being your own choice, stop. take a look at what you’re doing to yourself and how you’re affecting your partner. It could be best for you both to split. If you’re single, then this may signify the end of your single status. 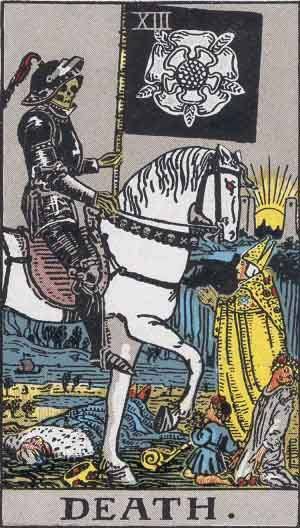 The Death tarot card in a romantic sense is all about change. Friends – Death in regards to friendship might mean you will lose some of your friends. The key here is that it is beyond your control, like all interpretations of Death. Remember that it is for the greater good. You can use it as a learning experience to grow. If you don’t want to lose your friends (and why would you?) then look at things that have been causing rifts or arguments and try to patch things up as soon as possible. There is no reason to delay. Money – Death in regards to finances is not a good sign. Be careful with your spending, especially if you feel that you have enough money right now. Are you buying things, and being frivolous with your money simply because you feel like you have disposable income? The wealth of money is in it’s potentiality, it could be working for you and others much more than it already is. If you can get rid of something you never use to help yourself out in the short term, then by all means do it now. Health – Death doesn’t look like a good omen in regards to health at all. Take care of yourself. Are you the sort of person who avoids the doctor, or who likes to sweep things under the rug? Now is a good time for a checkup, whether it’s your eyes, teeth, or a physical. Try to get some contact with others. Death is a solitary figure which you do not want to become. Spirituality and Mentality – Death in spirituality can represent understanding of a concept. You may have been studying something for a while, and grasped it. It’s time to work on something new and get a new viewpoint. Nothing can beat a second opinion. The universe has many apertures, and you are one of them. Cultivate your own views through new opinions and study. In reverse, the Death card can signify that some aspect of your life should end, but hasn’t yet. Be it a workplace, relationship or idea, you should look into giving it up. We hang on to things in our lives, especially when they are past their prime, in the hopes that we can repair them, but this isn’t always the case. Consider the aspects of your life which you are holding onto. Is it healthy? Is it improving your life and the life of others? We’ve selected live tarot readers to give you a FREE 3 Minute interpretation of the Death Tarot Card! Scroll through them below and pick your favorite one.